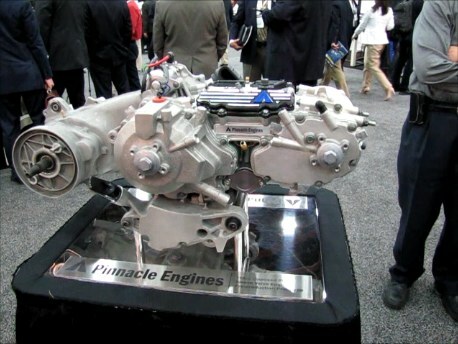 At the SAE World Congress 2012 in Detroit, Pinnacle Engines shows how its unique valve design along with its architecture addresses the global requirement for improved fuel economy at an affordable price. Opposed-piston engines have been around for quite some time mostly in two-stroke form but suffer from an emissions perspective. So, that is why Pinnacle Engines stood strong among its many peers at SAE World congress 2012 in Detroit. The company has developed an ultra-efficient engine design based on a four-stroke, spark-ignited (SI), opposed-piston, sleeve-valve architecture using conventional engine manufacturing technology. The company says that the architecture, developed in-house in conjunction with FEV, incorporates two old efficiency ideas into one package, improving both in the process. My conversation with Tom Covington, Vice president, Marketing & Special Products, proved quite revealing. I was impressed with his knowledge but more with his clear answers to questions. The Pinnacle Engine is spark-ignited, twin-crank, single-cylinder, opposed-piston design. The 250-cm³ architecture uses dual-camshaft-actuated reciprocating sleeve valves for induction and exhaust in a traditional four-stroke cycle. The sleeve valves are linearly actuated and seal on an angled valve seat. Fact is, opposed-piston engines have been around for quite some time. Think Subaru, for example, which has a single crank. Pinnacle, on the other hand, has an opposed piston design with two crankshafts with a common head. It reminds me of the Tour Engine which is a split cycle. However, Pinnacle is a traditional 4-cycle. Other opposed-piston designs usually appear in two-stroke form, though. Unfortunately, those suffer with poor emissions. Some have traditional poppet valves. Sleeve-valve engines have some decided advantages in knock resistance and power density, but they too have emissions-related challenges due to the sleeves’ lubrication circuit. Here is where Pinnacle shines. According to Covington, the Pinnacle design uses sleeve valves to enable a four-stroke cycle in an opposed-piston architecture. It is the use of a novel sleeve valve design that operates like a traditional poppet valve that makes the difference. Unlike traditional two-stroke sleeve valve designs, the Pinnacle design allows the lubrication circuit to be fully isolated from the inlet/exhaust flow, thus keeping it away from burning and counting as emissions. The result is an architecture that provides better thermal efficiency through reduced heat loss, improved combustion, and a wider operating range. But wait, there is more. Covington was quick to point toward a packaging model on the floor which had the packaging volume minimized when compared to a tradition inline four. That is the net result of an opposed piston with dual crankshafts. While we did not discuss it, the company website indicates the opposed-piston engine uses the Cleeves cycle at high loads. This is an operating mode in which spark timing is highly delayed from best power spark advance, to enable knock-free operation at an elevated 15:1 compression ratio using 87 octane fuel. In the session and paper, company engineers provided insight into the fixed-geometry configuration of the 250-cm³ single-cylinder engine model that they used for show and tell; and the one avalied on the floor for display. Most important, the architecture addresses the global requirement for improved fuel economy at an affordable price. How unlike electrification which is having problems selling in high volumes in America let alone China and India. So, the company says that the “dollars per percent improvement” metric for the architecture is dramatically better than competing technologies. Nice to know that someone is paying attention to affordability for a change. While the engine architecture is reported to be well suited to advanced configurations such as variable compression ratio (VCR), the initial focus of this design is for developing countries where low initial cost is of paramount importance. That is why one of its first high-volume engines will appear in the Asian market as a scooter in 2013. Still, Covington told Torquenews that he was not discounting the design for use in autos.